(Image 1) This is our “base line” soil test from December 2010. Travis had just moved back to the ranch and began to focus on the soil health. He had taken over management from his father who was a conventional farmer. A basic soil test is key to understanding what’s going on below the surface. In this base line test there is a lot of red on the chart, meaning low levels of macro and micro nutrients. There are a few things that really stand out: 1) the hummus, now referred to as “active organic matter” was low in all of the pastures sampled. The total % organic matter wasn’t too bad, but not great either other than the Creek Pasture which is most likely due to historical flooding. The salts in Creek Pasture were high due to many years of fertilization by my father with salt based nitrogen fertilizers. All of the micronutrients were low and inadequate. We tested the same pastures again in 2017 and the changes are a stark contrast to 2010. (Image 2) The above image is our soil test from March 2017. It’s a stark contrast to the base line soil test in 2010. First, to help you better understand the comparison we need to cross reference the pastures. From Image 1 Home Pasture, Creek Pasture and Big Field are the same. We added on another field in 2017, HP #1 (Home Pasture #1 is on top of the hill and Home Pasture is below in the valley. We split them up because they are very different sites and soil types. To begin analyzing this test take a look at the % of total organic matter. Nothing is below 3.67 and most are above 4%, which is absolutely astounding. The active organic matter is adequate except for the Big Field. This field was plowed for the past 100 years, so it’s still recovering. I think we will see this change substantially by 2021. Next look at how the salts plummeted to an optimal level. This is simply due to the fact that we haven’t used synthetic fertilizers since 2009 on any of our pastures. 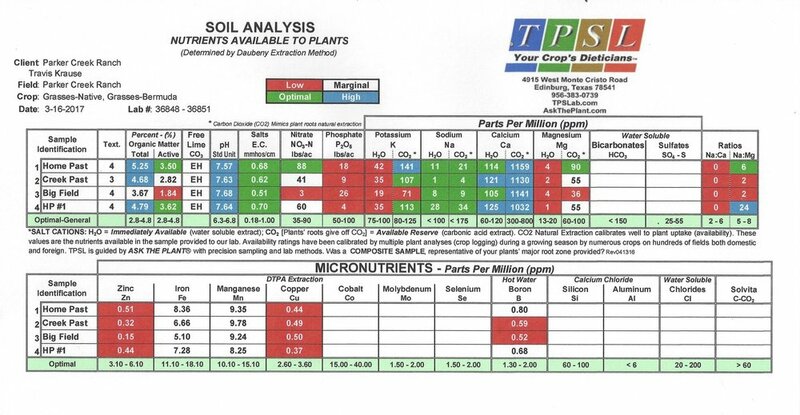 The macronutrients are beginning to balance, but much of the imbalance and low levels is due to the nature of our clay soils. Lastly, check out the micronutrients. Iron and Manganese have reached marginal levels, while Zinc and Copper are still low. We are really interested to see how this changes over time as we improve the plant communities and ultimately the soil.